Ali Shilatifard, PhD, director of the Simpson Querrey Center for Epigenetics, chair of Biochemistry and Molecular Genetics, Robert Francis Furchgott Professor and professor of Pediatrics, was the senior author of a study published in Nature Medicine. Though mutations in a gene called MLL3 are common across many types of cancers, their relationship to the development of the disease has been unclear. Now, a Northwestern Medicine study has identified an epigenetic imbalance that silences the expression of tumor-suppressing proteins, allowing cancerous cells to proliferate. In the study published in Nature Medicine, Northwestern investigators applied a simple molecular inhibitor that reversed epigenetic imbalance in laboratory models. This inhibitor has a potential therapeutic application, and the study will be followed by a clinical trial led by Northwestern investigators. “This is a simple molecular concept with major clinical significance,” said Ali Shilatifard, PhD, director of the Simpson Querrey Center for Epigenetics, chair of Biochemistry and Molecular Genetics, Robert Francis Furchgott Professor and senior author of the study. Mutations in MLL3, a component of a complex named COMPASS discovered by Shilatifard’s laboratory, were one of the most frequently identified mutations in cancer, according to an analysis of publically available genomic data performed as part of the current study. The investigators found the presence of MLL3 hot-spot mutations was correlated with significantly lower cancer survival rates, indicating there was some oncogenic mechanism triggered by the mutations. After a series of biochemical experiments, they found success when examining the relationship between MLL3 and a molecule complex called PRC2. MLL3, as part of COMPASS, normally promotes the expression of numerous tumor-suppressing genes that are immediately downstream. However, the study found that if there are specific mutations in MLL3, it will not be recruited to the right location on the genome. Instead, PRC2 becomes dominant and prevents downstream tumor-suppressor gene expression. Lu Wang, PhD, postdoctoral research fellow in the Shilatifard laboratory and lead author of the study published in Nature Medicine. “If you silence the tumor suppressors, you get an increased risk of tumors,” Wang said. Having identified the mechanism that leads to cancerous growth, the investigators’ next effort was to interrupt the cycle. By applying a small PRC2 inhibitor, preventing PRC2 from silencing the downstream tumor-suppressor genes, the scientists were able to restore normal function and slow tumor growth. According to the authors, this pathway has therapeutic potential; Northwestern Medicine investigators have begun laying the groundwork for a clinical study. Josh Meeks, MD, PhD, assistant professor of Urology and co-author of the Nature Medicine study, will be leading a clinical trial of the method along with Maha Hussain, MD, the Genevieve E. Teuton Professor of Medicine and deputy director of the Robert H. Lurie Comprehensive Cancer Center of Northwestern University. The trial will treat patients with both advanced-stage bladder cancer and the MLL3 mutations with the PRC2 inhibitor, investigating if the inhibitor can improve survival rates. If it works, the implications could be significant, according to Shilatifard. 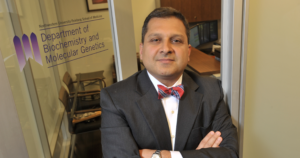 Meeks is also an assistant professor of Biochemistry and Molecular Genetics, Hussain is also a professor of Medicine in the Division of Hematology and Oncology and Shilatifard is also a professor of Pediatrics. The central concept behind the Nature Medicine study — epigenetic errors leading to cancer — was first identified by Shilatifard’s laboratory over 20 years ago. That discovery opened up a new area of inquiry, according to a new review published in Nature Reviews Molecular Cell Biology. Correcting imbalance in transcription, as shown in the Nature Medicine study, could be put to use in other cancers as well, according to Shilatifard. “We think this is a central dogma for future therapy,” Shilatifard said. Other Northwestern co-author authors of the Nature Medicine study include Yoh-hei Takahashi, PhD, research assistant professor of Biochemistry and Molecular Genetics; Edwin Smith, PhD, research professor of Biochemistry and Molecular Genetics; Panagiotis Ntziachristos, PhD, assistant professor of Biochemistry and Molecular Genetics and of Medicine in the Division of Hematology and Oncology; Jeffrey Savas, PhD, assistant professor of Neurology in the Division of Movement Disorders and of Medicine and Pharmacology; Lihua Zou, PhD, assistant professor of Biochemistry and Molecular Genetics; and Rintaro Hashizume, MD, PhD, assistant professor of Neurological Surgery and of Biochemistry and Molecular Genetics. Shilatifard, Meeks, Hussain, Ntziachristos and Hashizume are also members of the Lurie Cancer Center. Additional co-authors include Shilatifard lab members Zibo Zhao, PhD, postdoctoral research fellow; Patrick Ozark, bioinformatician; Stacy Marshall, lab manager; Emily Rendleman, research technician; and Marc Morgan, PhD, postdoctoral research fellow. Other co-authors are Damiano Fantini, PhD, postdoctoral research fellow in the Meeks laboratory and Xingyao He, research technologist in the Hashizume laboratory. 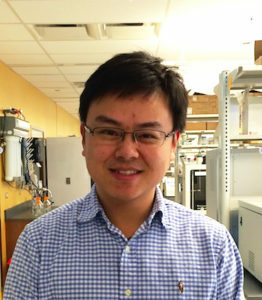 Wang is supported by the Training Program in Signal Transduction and Cancer grant T32 CA070085; Zhao is supported by the Robert H. Lurie Comprehensive Cancer Center Translational Bridge Program Fellowship in Lymphoma; Smith is supported by National Cancer Institute grant R50CA211428; Savas is supported by National Institute on Deafness and Other Communication Disorders grant DC013805; and studies in Shilatifard’s laboratory related to COMPASS are supported by the National Cancer Institute’s Outstanding Investigator Award R35CA197569. Fei Chen, a fifth-year student in the Driskill Graduate Program in Life Sciences and a member of Shilatifard’s laboratory, was first author of the Nature Reviews Molecular Cell Biology paper.